The first page of each two-page lesson features a learning objective, a literacy activity, extension activities, a daily reflection, and vocabulary. 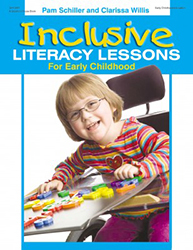 The second page has adaptations specific to the literacy lesson for children with special needs. A great grab-and-use book for preschool teachers!